Published Jan 30, 2015 by Pearson IT Certification. Part of the LiveLessons series. Over 21 hours of training so you can pass both the Red Hat Certified System Administrator (RHCSA) and Red Hat Certified Engineer (RHCE) exams. Includes interactive practice exam questions, exercises and quizzes so you can put your knowledge to the test. Red Hat Certified System Administrator (RHCSA) and Red Hat Certified Engineer (RHCE) Complete Video Course LibraryRed Hat Certified System Administrator (RHCSA) and Red Hat Certified Engineer (RHCE) Complete Video Course Library provides the opportunity to study for both the Red Hat Certified System Administrator (RHCSA) and the Red Hat Certified Engineer (RHCE) exams. This Complete Video Course Library offers more than 21 hours of personal visual instruction from an RHCSA and RHCE certified expert with more than 20 years of practical Linux teaching experience. 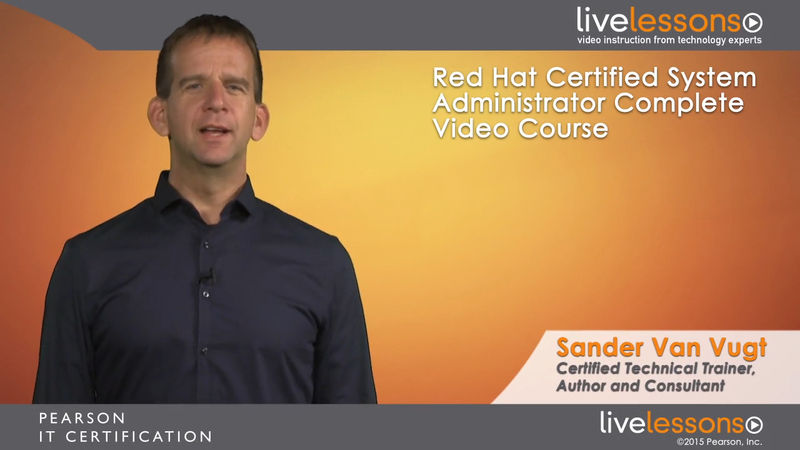 Through the use of topic-focused instructional videos you will gain an in-depth understanding of the Red Hat Certified Administrator (RHCSA) and Red Hat Certified Engineer (RHCE) exams as well as a deeper understanding of Red Hat Enterprise Linux so you master key foundational principles. Included with the product are practice exams, with the instructor walking students through both the scenarios and solutions. The course includes 100% coverage of the RHCSA and RHCE exam objectives, practice exams demonstrated in a real CLI environment, dynamic and interactive hands-on exercises, and multiple-choice quizzes to give you the extra edge you need to excel on the exam. 15.10 Dealing with "Enter root password for maintenance mode"